'Do You Want To Talk To The Man-In-Charge, Or The Woman Who Knows What's Going On?' Across several decades (and despite widespread sexism) women workers, supporters and associates shaped the story of America's most weird, colorful, sui generis rock and roll band. Growing up in the late 1950s and early '60s, Betty Cantor developed an early talent for tinkering. "I used to take things like radios, other little electronic devices if they didn't work, open them up, mess with them, put them back together and they worked," she remembers during a recent phone call. "I could fix watches that wouldn't work for anybody else." Her fascination with how things worked helped her breeze through the available math and science classes at her Martinez, Calif. high school to the point that, she said, "they ran out of things for me to do, so they let me go over to the college to play at the lab." "Math was fun, I enjoyed it, and science was discovery," she says. "The universe is math, right? Just how it all fits together." She began traveling regularly, sitting in on seminars about chemistry and metallurgy in Berkeley and San Francisco in the '60s — a place where lots of other young people were also investigating, in lots of different ways, how the universe fit together. That's where she met the Grateful Dead, with whom she'd eventually travel thousands of miles over close to 20 years, recording hundreds of hours of tape and becoming one of the many female workers, supporters and associates who shaped the story of America's most weird, colorful, sui generis rock and roll band. "I read everything back to 1943 on [psychedelics] basically, and decided maybe there was an answer to why I felt like an alien where I lived," she says. "I decided I was going to see colors and tastes and I wasn't going to go crazy. I had made that decision." At some point during her senior year, Cantor went to San Francisco and took her first acid trip. "And I ended up at 710 Ashbury Street," she says — the Victorian house where members of the Grateful Dead and associates lived together, like turned-on, tuned-in fraternity brothers, in 1966 and '67. "Bobby [Weir] opened it up, he had his guitar on him, and he just ushered me in," she remembers. "He bowed and said 'Come on in.' That was that." Cantor's inaugural dose of LSD-25 might easily have come via the efforts of another couple of young women in the Dead orbit: Melissa Cargill and Rhoney Gissen, two Berkeley undergrads who shared a boyfriend named Augustus Owsley Stanley III, or Bear for short. Gissen was a Berkeley transfer student, a former Mount Holyoke lit major attracted to the wild scene burgeoning on the opposite coast. She and Cargill became lab assistants for their partner, helping to synthesize a pure and potent LSD that has been lovingly memorialized in media ranging from Jefferson Airplane song lyrics to official biographies. 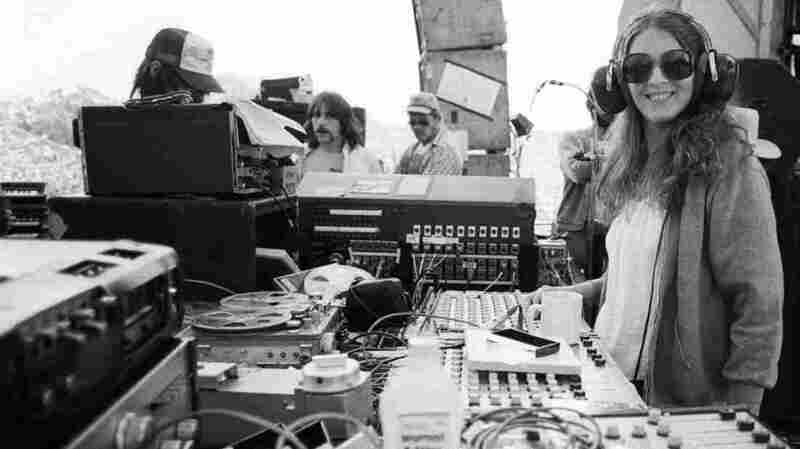 They also became experts in setting up and taking down the huge Wall of Sound PA system Bear — a Renaissance man of the hippie era, who was also an early adopter of the high-protein low-carb diet and believer in global climate change — invented, revolutionizing concert sound. In her 2012 book Owsley and Me: My LSD Family, Gissen (now known as Rhoney Gissen Stanley after taking on Bear's last name, though the two never married) writes about how the Dead provided a backdrop and a context for her own personal awakening: expanding her mind, questioning her assumptions and becoming confident in making her own choices — including the choice to leave the group's immediate orbit in the early 1970s, once she had a young son to care for. "One of the reasons I left was that I wanted to forge my own path," she says. "Other women felt the same; we didn't want to raise our kids around a drug-taking, rock and roll environment." "A lot of women were unable to come into their own until they actually left the scene," she continues, although many formed what she called "cottage industries" that orbited the band: travel agencies, fashion design, poster art, ticketing, newsletters — and many also stayed in touch, even after leaving the active scene. "I still talk to women I met in 1968 [through the Grateful Dead]" she says. "The women formed a community, and that community still exists. Our children had children, and the grandchildren are friendly." Meanwhile, back in the '60s, Cantor didn't run away with the Grateful Dead circus immediately. She had some experience booking bands for events at her high school back across the bay, so here in her new cosmic counterculture world, it made sense to get a job at the Avalon Ballroom, the historic venue on Sutter and Van Ness where promoters like Chet Helms and Bill Graham booked acid-friendly groups like the Dead, the 13th Floor Elevators and Jefferson Airplane. Cantor started out putting up posters around town for the Avalon, then moved, in swift order, to running concessions, running the box office and finally, traveling to Denver in late 1967 to help the Helms' Family Dog collective set up an outpost. The Denver project was short-lived, and Cantor was back in San Francisco by 1968, working at the Carousel Ballroom and learning sound engineering at an underground FM station, thinking she might want to be a DJ. That led to an apprenticeship with Dead recording tech Bob Matthews, who she met (and briefly dated) while handling concessions at the Carousel. "Their subsequent romance," longtime band publicist and historian Dennis McNally writes, "did not obscure the fact that she turned into a good engineer as well as an ace hot-dog salesperson." In the end, Cantor chose mics and tape over hot dogs, though, working as an engineer and producer on official live and studio albums from 1968's Anthem of the Sun through 1981's Dead Set — and perhaps more importantly, recording hundreds of reels of soundboard tape. In a community of fans that prizes each live document of the band for its own special terroir, its unique setlist and vibe, Betty Boards became some of the most celebrated; it was a Betty Board that the Library of Congress, in 2011, inducted into its National Recording Registry to commemorate the particularly legendary May 1977 concert at Cornell University's Barton Hall. Cantor had been solidly ensconced in the Dead camp — which was expanding as colorfully as the images in a liquid light show at the Avalon — for several years when Candace Brightman signed on for her own long, strange, multi-decade trip. Raised in the Chicago suburbs, Brightman had studied set design at St. John's College in Annapolis, Md. and then made her way to New York City, a childhood dream. When she applied for a cashier's job at the Anderson Theater on Second Avenue — a forerunner to Bill Graham's Fillmore East and later, a very brief expansion of CBGB — she was turned down, but sent backstage to see if they had anything for her. They told her to come back on Friday. "So I came back Friday, but there was nobody there to teach me," she tells me on the phone from her home in Hawaii. "It's clear they're about to start the show... The band came onstage, and I hit a circuit breaker. Everybody seemed pleased... I thought, 'Oh, okay. That's not too hard.'" "Scrabbling around lower Manhattan with weird jobs was a big adventure," she says. "I was born in '44. I was supposed to grow up and marry some rich guy. That whole thing never took with me at all. I was always getting sent to detention study hall in high school, and getting in trouble with the police and everything — I mean, not getting in trouble with them, but I liked to run away from them when they were trying to catch me. I just liked to have a lot of fun, and I didn't like people who took themselves too seriously... and the Dead were so into absurdity, which is one of my favorite things in the world." Among the theater people and the hippies and rockers in the East Village, she'd found her tribe. There was an overlap between the staff of the more loosely managed neighborhood rock venues and nearby NYU's technical theater department so, serendipitously, Brightman picked up formal skills on the job. She lit the Grateful Dead at the Anderson and the Fillmore East, as well as during their famous 1971 run at the Capitol Theatre in Port Chester, N.Y., a little ways outside the city. That was where Jerry Garcia, after a gig opening for the Mahavishnu Orchestra with keyboard player Howard Wales, invited her to join the gang. It felt like the perfect job for a designer who had always felt creatively in tune with light ("I don't like certain times of day," she answers when I ask if she feels like a visually-oriented person, "I could never have worked in an office because of fluorescent lighting") and who gravitated toward the eccentric and the unpredictable. Brightman became the Grateful Dead's first touring lighting designer, hitting the road with them (and Betty Cantor) for the Europe '72 tour that would become an iconic live triple album of the same name. A 1973 Rolling Stone article about the burgeoning Grateful Dead business empire reveals the beginnings of the patchwork quilt of band-related cottage industries Rhoney Gissen Stanley remembered. Frankie Weir, Bob's then-partner, ran a travel agency called Fly By Night that handled tour details for the Dead and other bands. Eileen Law managed the office and the growing fan mailing list (which introduced the phrase Deadheads into the lexicon) which she continued to do well into the 21st century. Betty Cantor was a cofounder of Alembic, the Dead-associated gear workshop and studio established in 1968; Phil Lesh's ex Rosie McGee, who had changed her name from Florence Nathan, worked there and at Fly By Night well after the breakup. Drummer Bill Kreutzmann's wife Susila, who also owned a boutique, made T-shirts — an enterprise that Dennis McNally, author of the epic 2002 band history Long Strange Trip: The Inside History of the Grateful Dead, theorizes could well have been the dawn of the rock and roll shirts as concert merch. "They basically only trusted women with their office and their money, from 1970 on," McNally tells me — after the famous financial debacle in which drummer Mickey Hart's father Lenny managed to embezzle more than $100,000 from band accounts during a stint as manager. That's corroborated by the detailed 1994 reference text Skeleton Key: A Dictionary for Deadheads. It sets the scene in its entry for "Office" with the description of a sign there that read: "Do you want to talk to the man-in-charge, or to the woman who knows what's going on?" The office, the entry goes on to say, was "primarily the domain of strong, unpretentious women," represented heavily in accounting, fan relations, licensing and publishing and other roles. Cantor was on the board, Brightman directed the lights, Cargill and Gissen had made the dope and set up the revolutionary sound system (under Owsley's stewardship) and back at the office, several departments boasted reasonable gender parity. So was the Grateful Dead a precociously woke organization, a paragon of women in psychedelic STEM? In Long Strange Trip, McNally answers bluntly in the negative: "It would be ridiculous to suggest that the Dead is a bastion of feminist liberation." His observation comes in a mini-chapter titled "Interlude/Intermission: 'Waits Backstage While I Sing to You,'" a reference to the American Beauty track "Sugar Magnolia," that ode to the capable and patient band girlfriend ("takes the wheel when I'm seeing double / pays my ticket when I speed") usually assumed to have been inspired by Frankie Weir. McNally's interlude covers much of the same ground as Skeleton Key's peek inside the Dead offices, although perhaps with more emphasis on the relationships between the extended family of employees, colleagues, friends and lovers that turned on the band's axis, with the lines between identities often blurred. The Rolling Stone piece describes that community with the term karass, a Kurt Vonnegut coinage from his 1963 sci-fi novel Cat's Cradle — from which the band got the name of its music-publishing company, Ice-Nine — meaning a group of otherwise-unrelated people who are destined to go through life linked to one another. (Considering how connected so many old-school affiliates seem to remain today, the term seems presciently accurate.) Women, the gist of the chapter seems to be, were full-fledged karass members on their own Grateful Dead path — divorces, breakups and job changes notwithstanding. Still, McNally makes clear, it was no gender-neutral utopia. The same chapter, set in the '80s, quotes a roadie overheard saying "I love the sight of spandex in the morning." "The Grateful Dead were, absolutely, sexist," McNally tells me. "They were the victims of stock mid-century American male privilege and attitude. No question. But at the same time, they had ... very strong, interesting and creative women who weren't shy about their opinions... So they weren't dumb and they weren't Neanderthals and they learned things." Stanley, who is at work on her own history of women in the sprawling Grateful Dead scene, tells me that the de facto sexism of the rock world was actually a bit of a blessing for her and Cargill during their time with Owsley. "When we traveled, like to Monterey Pop, and we were at the airport – to just be a girlfriend sitting on the trunk looking pretty was a way of protecting the fact that we had all these chemicals with us," she says. Amir Bar-Lev, who directed the 2017 Grateful Dead documentary Long Strange Trip: The Untold Story of the Grateful Dead, agreed with McNally that the band's culture included a "misogynistic streak" – he said that to a Billboard journalist who asked him why the ambitious, four-hour film included so few interviews with women. Spouses and ex-spouses, and children – like Jerry Garcia's daughter Trixie – make up most of the female representation in the movie. Gissen, Brightman and Cantor don't appear; neither does Eileen Law or key early associate Carolyn "Mountain Girl" Adams Garcia, both of whom, Bar-Lev told Billboard, declined to participate. Donna Jean Godchaux — who was invited to and did agree to be interviewed for A Long Strange Trip — holds the distinction of being the only female member of the Grateful Dead. She sang in the band for almost all of the 1970s, while her husband Keith was taking his turn in the ever-shifting Dead keyboardist's chair (the perpetual morbid joke being that to play keys for the Dead is like taking on the drummer's job in Spinal Tap.) It's probably also fair to say that Donna wins the prize for most-criticized former band member. A Rolling Stone feature on her from 2014 begins with this apologetic lede: "Donna Jean Godchaux knows what you're thinking, especially if you're a Deadhead: That her voice wasn't always spot-on." "She had certain stage tricks, as it were, that violated the aesthetics of the Grateful Dead," he says, "which was no theatrics, no smoke bombs... There was a very puritanical streak to Deadheads that held great pride in the fact that they didn't wear costumes; it was all about the music." As for complaints about the recordings on which Donna appeared in the '70s: "It had a great deal more to do with the flaws of the albums," he says. "They did Shakedown Street coked out. It's a mediocre album. Plus, they just didn't like being in the studio. They did not make good studio albums. And 'Terrapin [Station]'" – the title track from the 1977 album that was the Godchauxs' second-to-last as band members – "was a masterpiece, as a song." Still, Donna Godchaux has so far gone down in history, in part, as the sort of Skyler White of Dead fandom: a female flashpoint of complaints. The Rolling Stone report from '73 — the year after Donna joined up — runs down the many departments buzzing away in the band's business hive. It refers to the crew's space in the office as the "boys' room," never mind that newly-hired Brightman appears briefly in the piece running lights and directing a union crew — and that surely, as Cantor was a member of the sound team, the room would have been her domain, too. But rock and roll production was — surprise of surprises — itself a boys' room, and Brightman and Cantor (who would soon marry road manager Rex Jackson) faced their share of challenges. Betty Cantor-Jackson also recalls having to do a certain level of social acrobatics just to get her job done right: "The only way I could get things done was to ask stupid questions that actually weren't stupid – they were questions designed to get them to understand what they were working with. I couldn't tell him, because that would not go, because I was a girl... [I would] play a dumb blonde and ask stupid questions and get them to understand their own self." Cantor-Jackson took the extra time to convince venue sound engineers that her ideas were their own, and in that way, she recorded an increasingly celebrated body of work, including tapes from Radio City Music Hall, Saturday Night Live and the now-enshrined Cornell '77 show. "I hated it, but there were times I had to do it," she says. "If I wanted to hear them play loud on TV, then I better make sure it works." Brightman and Cantor-Jackson traveled together on tour for years and were friends, though the nature of their different jobs meant their work didn't overlap very much. Still, as two women in a tech crew where women were scarce, they had to come up with a solution to cut down on the frequency with which they were mistaken for one another. People tended to look for Cantor-Jackson more often, so when they had the T-shirts made with her face on them, she says, "Candace's said 'No I'm Not,' and mine said 'Yes I Am.'" "We were all big dogs, kind of daring each other to do things," she says. She enjoyed a lot of it. The band had the right level of weirdness to keep her entertained — and she figures she had whatever strangely calibrated formula of personality it took to thrive in their singular company. One thing Brightman couldn't abide, though, was when the big dogs picked on the little dogs — and that was the crew, she says, not the band. She had her own team on the road – which often included other women – but other tech staff were definitely of the "spandex in the morning" variety, and it pissed her off. "That was really hard," she admits. "I wish to God they didn't have that crew. We could have had so much fun." "They talked so badly," she says. "Like, someone would say [about a female crew member] 'If she wasn't so ugly, I'd f*** her brains out.' I'd get in there and say 'Don't you ever talk like that around my crew.' That's where I put my foot down, when I see someone else getting abused." Cantor-Jackson left the band caravan in the '80s and never really returned. Her husband Rex had been killed in a car wreck in 1976, and at some point after that, she dated Dead keyboardist Brent Mydland. When they split, she felt alienated and frozen out, as an "ex-old lady." The ties of the karass weren't working for her, and financial problems snowballed. In the mid-'80s, she lost her house to foreclosure and put most of her possessions — including more than a thousand reels of tape, from the Dead and other groups — in a storage unit. But when she found herself unable to keep current on the fees, her things were auctioned off, Storage Wars-style. The lengthy saga — moldy or damaged tapes, buyers who figured out what they were, archivists who restored them and fans who eagerly welcomed them back into circulation — helped create one of the more dramatic narratives within the Grateful Dead storybook. Arguably, when the tale was reported in multiple publications, including Relix and the New Yorker, it also (deservedly) helped revive the sparkle on her image in the scene and beyond. "There was so much voodoo going on with the flower children, 'What sign are you' or, 'Let's throw the I Ching,'" she tells me. "I decided I needed to balance that by studying science." Today, she runs a holistic orthodontia practice in Saugerties, NY. The soldering skills she learned on Owsley's sound crew, she says, come in handy in her practice. Brightman continued to work in lighting design for Dead-related projects and, between 2004-2008, for the jamband Widespread Panic. In 2015, she came out of retirement in Hawaii to direct lighting for the Grateful Dead's 50th-anniversary Fare Thee Well shows at Chicago's Soldiers Field and Levis Stadium in Santa Clara, Calif. In a particularly bitter twist of irony, it was announced in early 2018 that Brightman — who had carefully, delightedly crafted the way bands were seen for more than 40 years — is losing her vision to age-related macular degeneration. Fans have set up a crowdfunding account for her treatment. Cantor-Jackson is the production manager, engineer and road manager for Glide Memorial, an inclusive Methodist congregation in San Francisco with an eight-piece band and up to 110 people in its choir. She also has an ongoing gig with the Chris Robinson Brotherhood and its associated projects, whose jam/Americana fandom overlaps heavily with Deadheads, recording their live shows as "Betty's Blends." For the 50th anniversary Grateful Dead celebration in 2015, Betty went to the shows in Santa Clara, instead of trekking to Chicago for the more-heralded Fourth of July weekend run. "I'm sure I could've gotten tickets, though," she says.